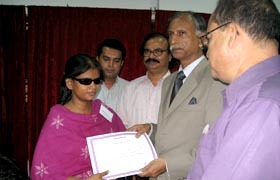 Certificate Giving Ceremony for the Visually Impaired Student has been organized on 16th April’09 at Senate Bhaban and Professor Dr. A. 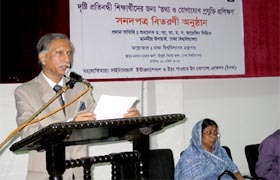 A. M. S. Arefin Siddique, Vice Chancellor, University of Dhaka was the Chief Guest. 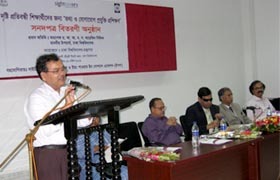 With a view to introducing Information Communication Technology (ICT) to the Visually Impaired student and staff in University of Dhaka a three month long training programme has been organized at Resource Centre of Central Library, Dhaka University from 2nd November 2008. The training programme has been initiated by Sightsavers International a UK based International organization along with Dhaka University Central Library. The training was conducted by Sightsavers partner Young Power in Social Action (YPSA), a pioneer organization on ICT and Development. 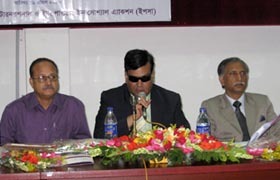 YPSA has been working for the Visually Impaired persons for the since long with a good reputation in nationally and internationally. Due to the continuous working in ICT section, YPSA has become expert on ICT promotion for visually impaired person.. A total of 36 students from different department and 4 staff of Central Library have participated in the programme out of which 20 are male and 16 are female.